Copperbelt Open Truckers Association of Zambia (COTA) has over the years been advocating for fair trade practices in the transport sector just to save and protect the industry from unfair competition practices likely to create a Monopoly environment that has a potential cripple our Zambian economy at the expense of Zambians. Act no. 11 of 2002 Section 100 on public sittings subsection (1), Subject to the provisions of section 108 and 109, state that “the Director shall, for the purpose of hearing and determining applications for the grant of road service licenses or the variation of terms or conditions of such Licence, and may for other purposes, hold a public sittings at such places within Zambia and at such times as appear to the director to be required, having regard to the purposes of this part and interests of parties concerned”. It is therefore from this back ground that Copperbelt Open truckers Association draws the strength to participate in the public sittings as stake holder on behalf of the Zambian Transporters as it is the entry point into the Transport Sector. Our Association’s objective is to ensure that we help our members in terms of presenting challenges being faced in their daily running of business to government institutions responsible. It is also in our interest to protect the jobs of our transporters from those with intentions to join the sector by underpricing, non-compliant to public and environment. Public need to understand that the purpose of having the public sittings is not only to grant or refuse the RSLs but to also ensure that there is sanity in the manner operators conduct their businesses, fair trade and no monopolies as stated in the Road Traffic Act no. 11 of 2011 section 108(26). 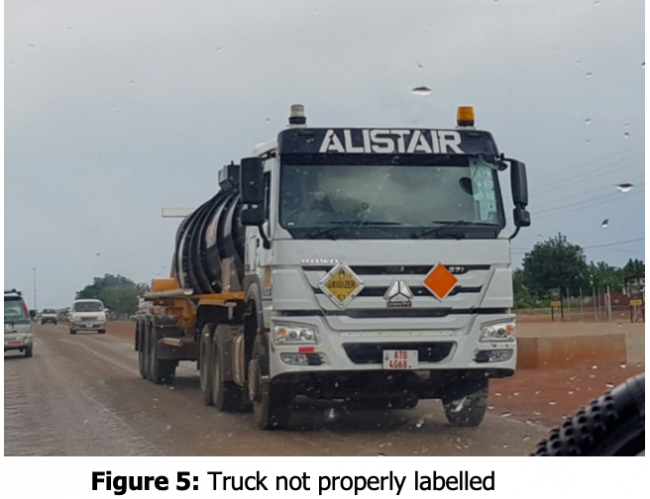 During a Road Transport Safety Agency (RTSA) public sitting held in Solwezi on the 10th of December 2018, the association objected an application to grant Alistair a Licence to operate in Zambia. With the submissions given under OATH, the company applied for 28 vehicles after declaring to have brought in 240 Trucks. The panel therefore asked the company to submit all documents for the declared number of trucks as it never made any logical sense to do variation at a later stage with such a big FLEET. Later the company opted to go to Lusaka RTSA sitting where they now applied for 74 trucks and 77 trailers coming to a combination of 151 units from 28. This trend of misinformation raised some serious concerns to why this operator was busy masquerading with information given to the public. This led to the association objecting for the second time despite the Company meeting the statutory requirements for the Road Service Licence (RSL) The association further went on to argue that the coming in of ALISTAIR a heavily OPIC funded operator meant for Tanzania is busy bringing such a huge fleet of Trucks without contracts had a capacity to resort to under pricing for them to have a market share in the industry which will eventually cause unfair competition that will disadvantage the local transporters who are already struggling in the industry. Below is a quick summery of how the U.S OPIC Transport funding meant for Tanzania is affecting our Zambian local transporters. 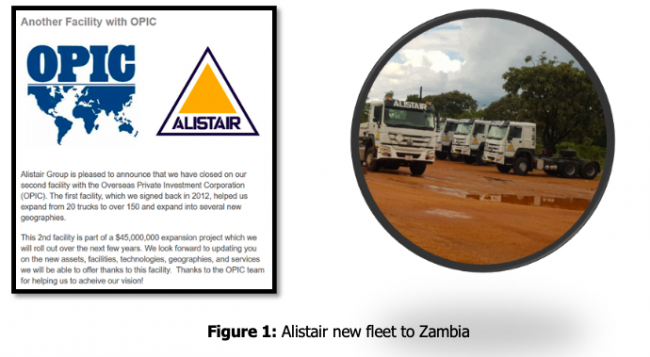 Alistair project was assessed under Tanzanian regulations and not Zambian. When extended to Zambia we feel there was need for OPIC to re-conduct an assessment on how the project will impact the transport sector in Zambia. OPIC finances companies strictly run by American citizens with business loans at 4% interest rates payable over duration of 10years with 3 year grace period. On the contrary, locally or Zambian run companies can only access loans from banks at far much higher interest rate not less than 16%. Thus, locally owned companies are failing to go as low as OPIC financed companies when it comes to pricing. Subsequently they are being booted out of business which is slowly leading to monopolizing the industry and causing an economic sabotage in the region. In as much as we appreciate U.S investment and AID in other avenues, such funding should have a positive impact on the Zambian economy and not just the U.S economy. We feel there has to be an economic balance and transparency for both countries as well as fair competition across board. We therefore demand an explanation from the U.S OPIC through the American Embassy to why they didn’t do a separate economic impact assessment on Zambia before allowing a non-environmental compliant company in our country. We also call for our Government institutions like ZRA to investigate issues to do with withholding Tax on OPIC loan, ZDA investment Licence which is easily accessed without assessing the economical impact on other local players in that sector, CCPC unfair competition and ZEMA compliance. For instance, with a huge fleet recently brought in Zambia (see snippet below) which was bought using OPIC loan we request them to show proof of them paying ZRA withholding tax on their OPIC Loan. Do they also have running contracts (existing customers) in Zambia for such a big fleet or they intend to have new contracts? If so, they should proof a list of clients here in Zambia for them to continue bringing a number of equipment. AS an international company specialized in transport with vast experience Alistair Group is expected to be familiar with the International Finance Corporation (IFP) performance standards with regards to Environmental Safety (PS4). 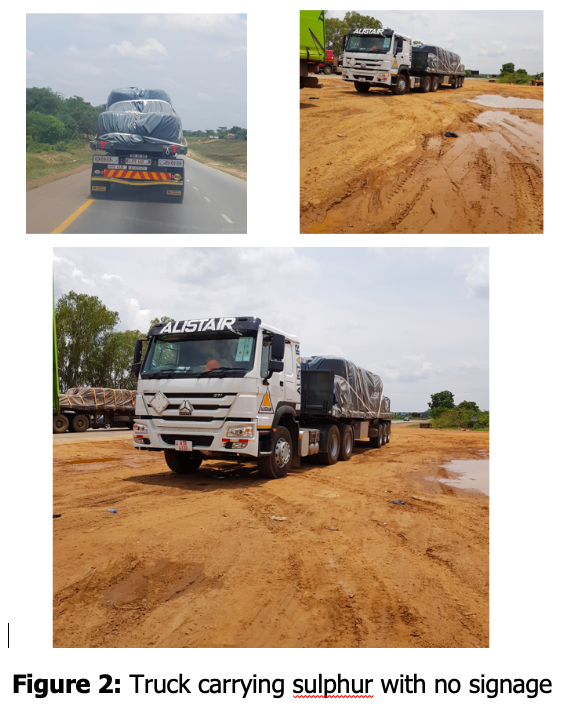 It is on record that Alistair Group has been transporting hazardous chemicals namely Sulphur without proper signage which is noncompliance as per Zambia Environmental Licensing regulations with regards to transportation of Dangerous Goods (See attached pictures – truck carrying sulphur with no signage and not labelled as per regulations impounded at Kitwe checkpoint and were handed over to ZEMA NDOLA – ZEMA to update on how this issue was handled). 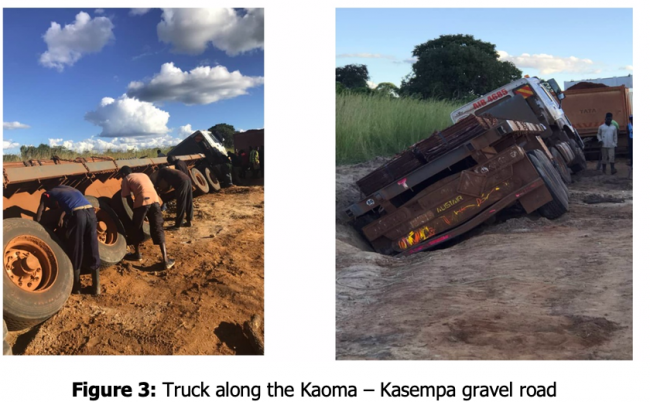 Moreover the company is also diverting most trucks to use a gravel road causing abnormal dust pollution to Zambian communities along the same road contrary to International Finance Corporation Performance Standard No. 4 which they are subjected to under OPIC. With all that huge funding they can’t afford to plough back in the community by rehabilitating the road (all because it’s America first and not Zambians). With the assessment done only in Tanzania the borrower (Alistair) is expected to operate on highly developed roads as per OPIC loan condition, we wonder if OPIC is aware that Alistair’s trucks are using undeveloped roads in Zambia possibly because no assessment was done in Zambia (See pictures a truck stuck on Kasempa – Kaoma road risking the locals). In addition to above anomalies, they have mislabeled the tankers & carry different chemicals in contrast to what is showing to avoid paying correct taxes. There is huge revenue loss on the part of the Zambian government & the people of Zambia because they are being deprived of what rightfully belongs to them & the local economy. With all these things happening it is objected that such companies have their operating license in Zambia withdrawn and sent back to the host country. The industry is struggling at the moment. And opening doors to such argents will end up suffocating the sector as it only benefits The American People. Remember its American First. But at a cost of a poor Zambian. COTA has seeing the number of its members slowly losing business to foreign owned but Zambian registered companies mostly those coming from East Africa who are bringing in huge numbers of fleets without any specific contracts except eying contracts of existing transporters. 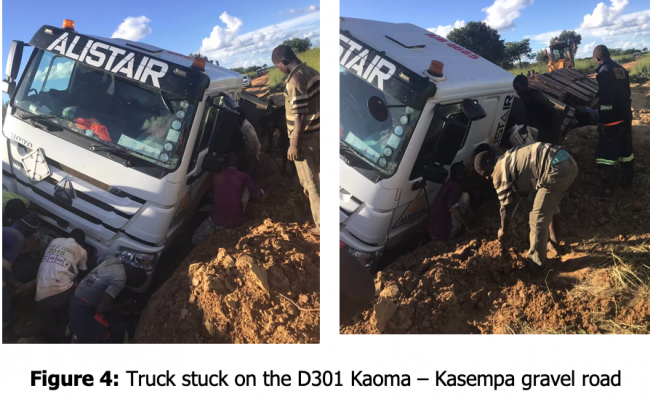 It is for this reason that we feel CCPC, ZRA, RTSA, ZDA, PACRA should work hand in hand to ensure that the local transporters are protected by ensuring that they engage each other before issuing documents to new entrants in the sector by way of assessing the impact it will create on Zambians. Recently there has been tension and accusations on Chinas relationship with Africa and in particular Zambia. Thanks to our PF Government for partnering with the Chinese Government as they transform the country with infrastructure happening throughout the country. We believe this has made U.S to make new pronouncements on how they intend to invest more in Africa. Again we would like to advise Govt and other countries that we must watch the strategy. If at all it will be similar to what’s happening with OPIC currently, then we must watch out!!!! !